This is the name given to those lines which run vertically downward from the outer corners of your mouth. Treatment of these little lines running from the the outside corners of the mouth is relatively straight forward. They are pretty much always treated with Dermal Fillers (although sometimes they can be improved with Botox®/Antiwrinkle injections). The procedure is fairly straight forward and results are seen immediately. There is generally a few little marks (which can easily be camouflaged with a little makeup) following treatment and swelling/puffiness is generally unlikely in this area of the face. - Your initial consultation is free, and you will be seen by Dr Sophie personally. – We will carefully discuss your main concerns and treatment options, along with a exact quote of the total cost of the treatment. – The benefits and disadvantages of treatment will be discussed fully. Special notes for Marionette lines treatment The Dermal Filler/”filler” products used are purchased by the syringe and the whole of this syringe will need to be used in the same visit. Once this area is treated to your satisfaction, the remainder of unused Filler will be used elsewhere on your face, at no extra cost to you. Generally any marks from treatment can be camouflaged with makeup and you should be able to continue with your every day activities, although you should avoid strenuous exercise, extremes of temperature (eg sauna) or a massaging the area within 48 hours after treatment. 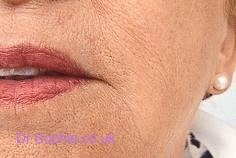 Often following treatment in this area of your face there can be some small marks generally these resolve within a few days, but you are therefore advised to have this treatment at least a week prior to a big occasion with one of the best products like Juvederm in order to ensure that you look your best.